Major progress have been made in recent years in many of these directions, thanks to a growing understanding of the mathematics and algorithms underlying folding. Nonetheless, many fundamental questions remain tantalizingly unsolved. This class covers the state-of-the-art in folding research, including a variety of open problems, enabling the student to do research and advance the field. This year we will be experimenting with online lectures. Students will be expected to watch recorded lectures, allowing in-class time to be more interactive through folding experiments, answering questions, collaborative projects, clarifying proofs, and exploring new results and applications. We will organize an optional problem-solving session, during which we can jointly try to solve open problems in folding. In the past, these sessions have led to important new results and published papers, as well as class projects. 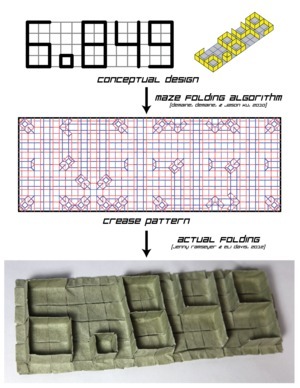 Class projects more generally can take the form of folding-inspired sculptures; formulations of clean, new open problems; implementations of existing algorithms; or well-written descriptions of one or more papers in the area. Projects can be purely mathematical (geometric) and/or theoretical computer science (algorithmic/complexity theoretic) and/or artistic. Students are also required to do a project presentation and a small number of problem sets. 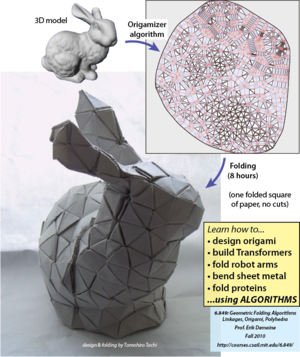 What forms of origami can be designed automatically by algorithms? What shapes can result by folding a piece of paper flat and making one complete straight cut? What polyhedra can be cut along their surface and unfolded into a flat piece of paper without overlap? When can a linkage of rigid bars be untangled or folded into a desired configuration? Many folding problems have applications in areas including manufacturing, robotics, graphics, and protein folding. This class covers many of the results that have been proved in the past few years, as well as the several exciting open problems that remain open. The textbook for the class is Geometric Folding Algorithms: Linkages, Origami, Polyhedra by Erik Demaine and Joseph O'Rourke, published by Cambridge University Press (2007). The list price for the hardback is $107. Some copies will be available at the MIT Coop at this price. Amazon offers a sale price of $88. A further reduced price is available as part of a bulk class purchase; let Erik know if you want to be part of it. Additional recommended reading is Origami Design Secrets: Mathematical Methods for an Ancient Art by Robert Lang. If you are interested in attending the class, for credit or as a listener, please join the 6849-students mailing list. This class was offered in Fall 2010, Fall 2007 (as 6.885), and Fall 2004 (as 6.885). You might be interested in the lecture notes, problem sets, etc. from those offerings.